With seven hotels and two resorts from Umhlanga in the north to uShaka Marine World in the south, as well as the area's leading entertainment destination, Suncoast (https://www.tsogosun.com/suncoast-casino), Tsogo Sun, which this year celebrates its 50th birthday, has an unrivalled presence in Durban. Collectively offering 1 958 rooms, 13 restaurants, eight bars, and a myriad of other facilities and amenities, the group's nine properties have been creating memories in Durban for five decades; when South Africans think of holidays, Durban is the top of mind city - and Tsogo Sun's hotels have continued to tick all the boxes for ideal accommodation, the best ocean views, the finest restaurants, and the easiest access to the city's beautiful beaches. Tsogo Sun's Durban heritage began with the opening of the Beverly Hills (https://www.tsogosun.com/beverly-hills) in Umhlanga by Sol Kerzner in 1964. From this, Southern Sun was born in 1969, and in 1971 the group's first new hotel was built, The Elangeni, on the Durban beachfront, which was followed by the iconic five-star Maharani. In 1981 Umhlanga Sands Hotel was bought and the Southern Sun Timeshare concept was launched, which subsequently included Cabana Beach Resort. Garden Court Marine Parade opened in 1985 with a distinctively art deco feel, and then Garden Court South Beach, previously Malibu Hotel, joined the family. In 2002 the group invested a further R1.4 billion into the Golden Mile - the single largest investment by any private company - with Suncoast Casino, Hotels & Entertainment, adding two hotels (Suncoast Towers and SunSquare Suncoast) and an array of entertainment, retail, gaming, fast-food and restaurant options. The ninth hotel, Garden Court Umhlanga, opened in 2010, and in 2013, Tsogo Sun transformed two of its beachfront hotels into the massive 734-room Southern Sun Elangeni & Maharani hotel (https://www.tsogosun.com/southern-sun-elangeni-maharani). Ravi Nadasen, COO of Tsogo Sun hotels, says, "We are proud of our position as a key role player in the Durban economy. 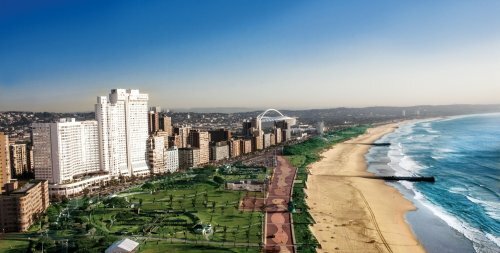 Our continued investment into our local properties is a reflection of our strong confidence in the area as an attractive leisure and business tourist destination, and in the eThekwini Municipality's significant efforts to ensure the beachfront promenade is a world-class attraction for local and international travellers." For more info on Tsogo Sun's Durban deals go to https://www.tsogosun.com/offers/durban-offers. The company's hospitality interests offer a wide distribution of hotels in Africa, providing world-class accommodation across all markets, including elegant, individually branded luxury hotels and well-known trusted market leaders in the premier through budget segments, including Southern Sun Hotels, Garden Court, SunSquare, StayEasy and SUN1 hotels. The exciting urban and resort casino portfolio includes the most popular entertainment destinations, strategically located throughout South Africa. In the Gauteng province, Tsogo Sun owns the group's flagship property, Montecasino in Fourways, which features, amongst other attractions, the award-winning Teatro; Gold Reef City Casino and Theme Park in Southern Johannesburg; and Silverstar Casino to the West in Krugersdorp. Additional properties are owned and operated in the Western Cape, Eastern Cape, Free State, Mpumalanga and KwaZulu-Natal, including the jewel on Durban's Golden Mile, Suncoast Casino, Hotels and Entertainment. Tsogo Sun is proud to be a Level 1 B-BBEE Contributor with 135% B-BBEE procurement recognition status, 62.1% black ownership and 34.4% black women ownership. Tsogo Sun invests substantial resources into developing skills, supporting emerging businesses, nurturing communities and creating awareness about the importance of conserving our environment. The cornerstones of Tsogo Sun Citizenship are managed as part of the group's sustainability and growth strategies within the specific areas of community, entrepreneurs and the environment. Tsogo Sun ("TSH") is listed on the Johannesburg Stock Exchange. The key shareholders of Tsogo Sun are Hosken Consolidated Investments Limited ("HCI"), a JSE listed investment holding company.